PelGar International Limited is the official supplier to the UK Ministry of Defence for CBRN (Chemical, Biological, Radiological and Nuclear) personal decontamination kits. PelGar’s CBRN kits are NATO and UK Home Office approved. PelGar’s CBRN Kits are used throughout the world not only by the military but are a crucial piece of equipment for the emergency services (Fire, Ambulance, Police and Civil Defence). Decontamination kits DKP1 and DKP2 are an essential part of military equipment that have been tried, trusted and used for over 75 years. 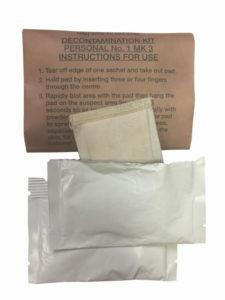 The decontamination kits can be used for any CBRN incident. They provide personal protection from chemical and bodily fluid contaminants. The kit contains Fullers Earth, a naturally occurring sedimentary clay composed mainly of alumina, silica, iron oxides, lime, magnesia and water, in variable proportions. The decontamination process involved, is the physical removal of the agent from surface, skin, clothing, footwear etc. Contains: Four BLOT-BANG-RUB double sewn sachets containing 20g of highly absorbent natural Calcium Montmorrillonite (Fullers Earth). The kit contains clear easy to understand instructions.